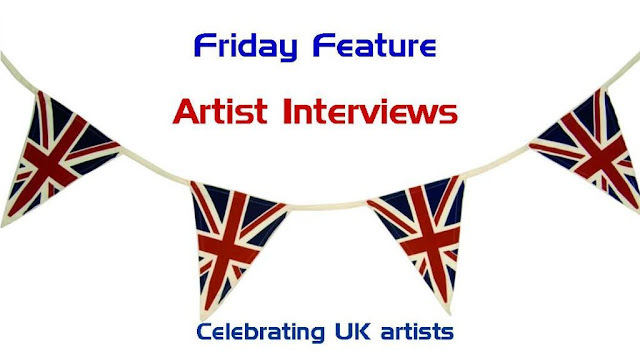 Starting on Friday 13th July, I will be introducing a series of weekly interviews celebrating the talents of British artists in the field of scrapbooking, photography, mixed-media, art journaling, feltmaking and quilting. Some names you may know and some may not be so familiar but they are all hugely talented. I am thrilled that they are willing to take part in this celebration. They include Kate Crane, Kirsty Wiseman, Sian Kibblewhite and Linda Kemshall. And no you don't have to have a 'K' in your name to be an artist! Share the information about the new Friday Feature on your blog, on Twitter (#celebratingUKartists) or on Facebook. You can 'borrow' the photo at the top of this post. Here's what you could win. I will announce the winners on Friday. Looking forward to seeing who wins and really excited about Friday. See you there. OK, have set up a post with a link on my blog and posted on Facebook. I am in the UK. http://meishansblog.blogspot.co.uk/ is my blog site. Looking forward to reading the interviews. I am a follower of your blog, and I would love the international prize. WOW, Bernice, this sounds great, I am seeing you do amazing things these days, God has you spreading your wings forsure!! I'm now following your blog ( thought I already was!! ) and I'm international. Looking forward to what you have to share!!! PS I am excited to see you doing the Art Journal group @ Just Be Yourself Ning aswell!! Im a blog follower. Thanks for the awesome giveaway. It is so generous of you. I didn't mention this before, but I am an international entry. I just realized I should have put all of my info in one comment. Sorry about that.